Posted by thelighthousestudio in campaign, celebrity, collaboration, exhibit. I never thought that I would actually shoot for one of my favorite channels on cable… and when I received that call for a meeting, I was dead excited! I was so curious! Me shoot for National Geographic? And so it has materialized, 3 shooting days at The Lighthouse Studio, it was fun! yes fun! and a great learning experience. Each personality that I shot also had to sit down for the video interview (which will also air on the channel) they were asked to prepare questions, things that they are or have been curious about, and the more they ask the more I got curious about a lot of things. “I have always wondered about how vast the universe is, I mean, our mind (brain) is only capable of understanding a fraction of reality, even if we come up with measurements from machines or formulas made by geniuses, these are only understandings which our brains can understand… I wonder, will there be ever a time when it would be possible to expand our understanding capacity to a more super human understanding?” did you understand all that? haha! 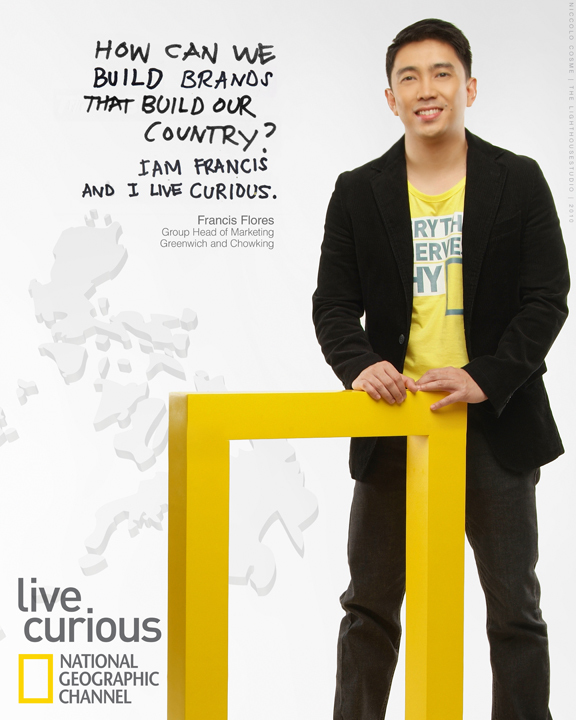 Most great ideas, concepts or story starts with “what if’s”, curiosity… Live curiously! let’s kill boredom! 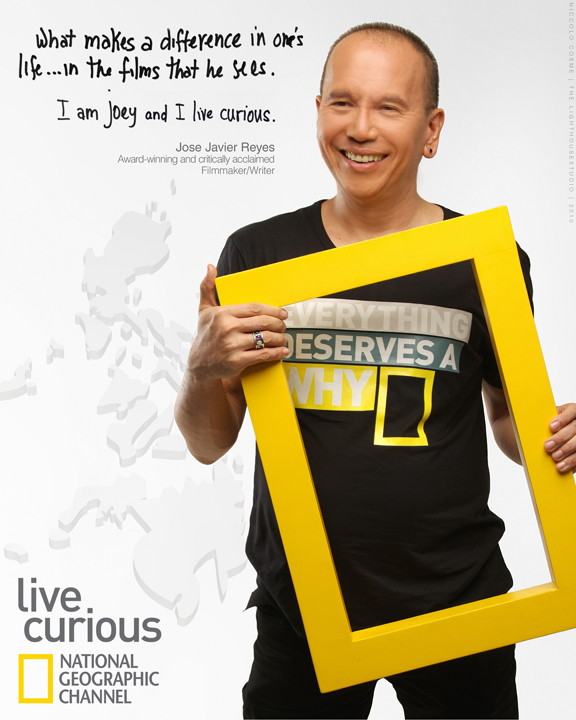 Please visit the National Geographic Channel Live Curious Photo Exhibit atThe Gallery, Greenbelt 5 on Oct 3-4. 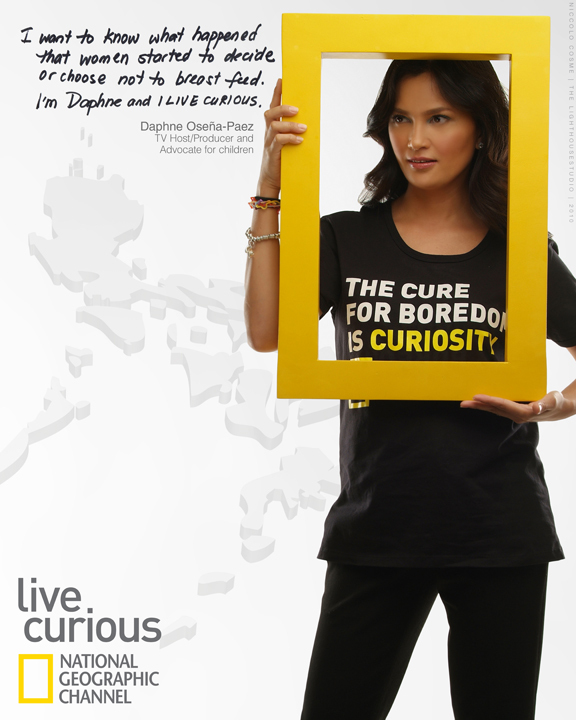 Glorietta on Oct 7-10. Trinoma on Oct 21-24. Bonifacio High Street on Nov 13-14. See the rest on the photo exhibit! see the schedule above! We are creative solutions company specializing on the services of Photography (fashion, beauty & commercial), Graphic Design (print ads, fliers, posters, brochures, banners, etc. ) and Advertising Concept Development.